While today might be Valentines Day, I for one believe that romance shouldn't be reserved for one specific day out of the year. Sure today is the traditional day of men showering their loved ones with flowers, chocolates, and/or jewelry, but what about the rest of the year. The gestures tend to be more memorable when unprovoked by a commercial holiday and what is more memorable than a romantic escape for two. The benefit of Ontario is that there are countless possibilities for you to take your loved one to a place that is new and something that you will both surely enjoy. Nothing sets the mood quite like a great meal and a good bottle of wine. The Niagara Region certainly offers plenty in the way of romantic sites and plenty of wine tasting opportunities and exquisite culinary. If you have never toured this wine region, we suggest a stay with White Oaks Resort and Spa, Pillar and Post or Inn on the Twenty; each conveniently located to several wineries and offering superior luxury. 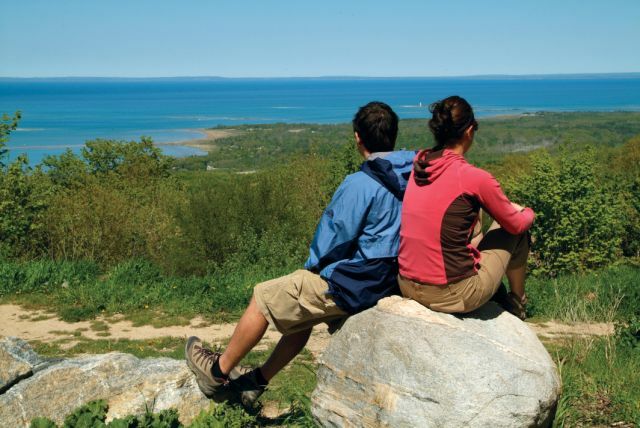 In Prince Edward County, you can stay at the Claramount Inn and Spa overlooking picturesque Picton Bay, partake in the culinary classes offered at The Waring House Inn or enjoy the private beach offered at Isaiah Tubbs Resort. If your romantic getaway needs to be something a little more intimate, then how does a private cottage or a room that includes a fireplace and maybe even a personal hot tub sound? Your loved one would be so pleased to stay at a place like Couples Resort which offers fantastic dining, private hot tubs (in most rooms,) scenic surroundings and a wide array of activities. Beauview Cottage Resort is another fantastic option that offers the peace and solitude of the country. When you stay at Beauview, you wake up to the sounds of the birds chirping unlike the typical big city noise. If you are into history, consider staying at one of our resorts that has been in operation for over 100 years. The Gananoque Inn and Spa main building was once a carriage factory. Throughout the summer months, you can take in a cruise of the beautiful 1000 island s, take in a show at the theater or visit some of the mueseums. Westover Inn began as a limestone Victorian Mansion in 1867 and throughout the years has expanded to now offer 19 acres including private cottages located on the Thames River. For the true "Northern Feel" Northridge Inn & Resort is one resort that would be a sure fit for your romantic escape. A stay at Northridge Inn is animated throughout the seasons with an array of activities, and serenity of wilderness calls all night long. Also with the northern feel is Trillium Resort and Spa which is nestled in amongst 86 acres of forest. Trillium offers waterfall viewing, a private lake and a truly indulgent experience through its 5,000 sq. ft. spa facility. Ontario offers so much to experience and the resorts mentioned above are just a sampling of the romantic escapes that await. For a complete list of resorts catering to romance visit us online.